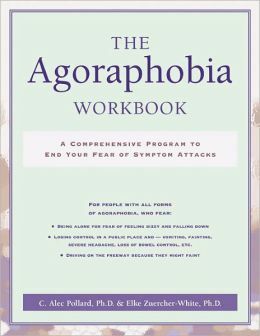 Co-authored by Dr. Zuercher-White, The Agoraphobia Workbook offers clear information about how the disorder develops and a practical, step-by-step treatment strategy you can use to control specific fears and symptoms. In an interactive, easy-to-follow style, the workbook takes you through exposure and desensitization exercises. By taking it step-by-step, you can work up to formerly difficult tasks like walking outside, driving, taking public transportation, and going to stores and malls. The book also includes tips on avoiding relapses, managing setbacks, and finding help and support. Agoraphobia involves intense fear/anxiety about engaging in activities and situations, such as driving, using public transportation, being in stores, standing in line, being home alone, and going to cinemas. A good way to conceptualize it is: “Agoraphobia is a maladaptive fear of and desire to avoid situations in which the individual believes a symptom attack may occur and result in incapacitation, humiliation, or some other catastrophe.” (From The Agoraphobia Workbook by Pollard, C.A. & Zuercher-White, E., 2003). The situations are feared because the symptom attacks come unexpectedly and are not controllable. Primary avoidance refers to the situation where a person totally avoids doing something they fear. Examples are not flying, driving on the freeway, going to parties, eating at a sit-down restaurant, using public restrooms, elevators, etc. When you avoid, you cannot learn that the situation is not as dangerous as you have made it in your mind. It is almost impossible to overcome fears while engaging in primary avoidance. Besides avoiding common places and situations, there are many ways to “save” oneself from the dreaded catastrophe by engaging in secondary avoidance strategies while being in the situation. These “safety devices” consist of safety signals, safety behaviors, and escape. While not quite as detrimental as primary avoidance, secondary avoidance also limits you tremendously and will never teach you to gain the confidence that you can do the things that other people do. Safety Signals can be a person or an object. Having a person accompany you is often a powerful safety signal. Among the most common objects are medications, water, paper bag to breathe into, cell phones, telephone numbers of nearby hospitals, food. Safety Behaviors can be infinitely subtle, such as listening to music or singing to distract oneself, sitting down, tensing up, leaning against a wall to prevent fainting, holding a glass to prevent the hand from shaking, telling a store clerk in passing that you are not feeling too well, were you to faint. Research has shown that using safety devices helps maintain the belief that without them the feared disaster would occur (faint, have a heart attack, lose control, have a stroke, be judged harshly because of shaky hands) and that anxiety will never go away. Make a list of all the avoidances, safety signals, and safety behaviors you employ. Set up goals and subtasks, and approach all the feared situations and activities without safety devices. If eliminating them all at once is too difficult – which for most people it is – start with smaller steps and move up. In vivo exposure refers to confronting feared situations, places, and activities. While this kind of exposure work requires a great deal of courage, it requires foremost willingness, that is, willingness to take difficult steps in the service of gaining something of value: to have flexibility to do different jobs, live in different places, visit places and people, engage in exercise and fun activities. The harder it is for you to do exposures, the more important it is to plan them in advance. Plan the day and time, and thereby you get around the temptation of monitoring your “good” and “bad” days. Exposures should ideally last long enough for you to learn something during the exposure session. After 1-2 hours, if not much sooner, your body’s reactions will slow down and your experience of fear will diminish: this is called habituation. If too difficult, start with smaller steps and build up the time or distance. With exposures that are short-lived by nature, such as elevator or escalator rides or one freeway exit, you can lengthen the exposure by doing “repeated loops.” Spend 15 min going up and down the elevator, make 10 one-exit freeway loops. Rather than monitor your anxiety level to decide when to stop, choose the length of time/distance in advance, depending on what you think you can handle plus a little more. Then based on how it went, plan to increase the time/distance next time or do the same again before proceeding. If you do a great exposure, but then time passes before you do it again, it is likely that you’ll start from square one. Try to do exposures a minimum of 3x/week, ideally 5-7x/week. The more limited you are, the more frequent the exposures need to be. If you do not walk outside alone or drive alone, you need to do these 7 days a week to see progress. You can take advantage of situations you are going to do anyway or have to do (picking up children at school, going to grocery stores, going to a family dinner). However, the most useful ones are the exposures you do totally voluntarily: they’ll move you forward the most. This refers to employing a person, carrying an object, or engaging in an action designed to “save” you in case of bad anxiety or panic. Do without them as soon as possible. Staying in the situation a little longer, preferably until the anxiety starts to diminish some. Returning to the situation as soon as possible, preferably within a few minutes or later the same day, but at the latest the next day. As soon as you are barely comfortable with one step, take the next step. Do not stay with the same situation or activity for a long time; progress will be slowed down if you do. The motto is: Keep moving forward. Do not come to a standstill. Go to your most feared situation when ready. Also go to the place of your first or worst panic attack. Unless you overcome all your fears, the phobias are more likely to return. Always keep pushing the limits and seek opportunities to strengthen the gains made; do not rest on your laurels. The ultimate goal is the reduction of fears. However, if you focus too much on it, it may backfire. The best is to learn to do things in spite of anxiety. It is good to do the exposures with a lot of variability. Do not follow a rigid hierarchy that you follow step-by-step; do things differently. If you fear elevators, do not just go to the 2nd floor, next to the 3rd floor, and so on. Instead go to the 2nd floor, 3rd floor, 5th floor, 7th floor, 4th floor, 10th floor, etc. Do some easier mixed in with some more difficult steps. If you have several fears, work on them in parallel: some driving, some going to stores, cinemas, standing in line, etc. This mixing and matching is also what allows you to do exposures 3-7 x/week (see item #3). Do things in different places, settings, times, and circumstances. The more you lengthen the exposures the better. This is because most people with phobic fears think that remaining in a feared situation longer is more threatening: more likely for anxiety or a panic attack to result in a catastrophe. Do not run from your sensations and feelings. Allow yourself to fully feel them, even if scary. As much as possible, purposefully bring on sensations you fear when you do the exposures. For instance, drink strong caffeinated drinks before walking in a mall, etc. You can do this after you have mastered the situation to begin with. Encourage panic attacks or other aversive experiences throughout your exposure practices! If you are willing, you can do it!!! We can help you get there. Fearing entrapment is pervasive in panic disorder, but particularly in agoraphobia. Since panic attacks are related to the fight/flight response, there is a strong tendency to want to flee or escape. Hence, the person is very sensitive to situations where he or she feels trapped. Recognize the situations where you tend to feel trapped, whether cinemas, theaters, classrooms, most meetings, freeways, crowded stores, lines, etc. A few situations do not lend themselves easily for this practice because they cannot be broken down into segments, notably flying, taking an exam, surgery, a meeting requiring your full presence, a job interview. Ask yourself in advance how long you think you can handle staying in the situation and plan to exit accordingly, i.e., by a preset time or distance, and a little longer or farther, not by how you feel. When the time/distance is up (keep track of the time!) leave even if you feel OK and wish to stay. Based on how you did the last time, estimate how long you think you can handle being there. It may be the same (in which case you repeat the plan) or you may think you can handle a little longer/farther away. You keep thus pushing the limits based on your best guess and tolerance level. Exit again and again until you are absolutely convinced that you can leave, which is precisely what the average person already knows. There is one warning. On one hand, these steps help you learn non-entrapment and knowing that you can leave. On the other hand, you certainly don’t want to live always with “exit” plans in your mind, comforting yourself by saying, “Well, I can always leave.” This would amount to a cognitive escape plan. So, learn non-entrapment, and learn to also tolerate high levels of anxiety, which is needed for your full and more enduring recovery.